These Dark Things by Jan Merete Weiss, a Mysterious Review. 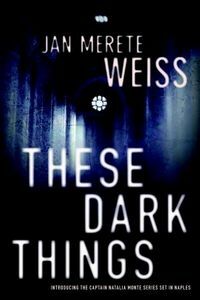 Review: Captain Natalia Monte of the Naples branch of the Carabinieri investigates the murder of a university graduate student, whose thesis centered on the relationship between the Church and organized crime, in These Dark Things, the first mystery in this series by Jan Merete Weiss. Teresa Steiner's body is found in the crypt of a local church. But there is little in the way of clues, as Natalia summarizes the case: "Carried her through a locked door into the church and down a narrow passage into the crypt beneath. Yet forensics hasn't found so much as a drop of blood along the route, none in the tunnel descending to the crypts. Not a drop, not a smudge, although at least the killer's hands must have been bloody, his clothes stained. And no one saw the assailant come or go." As Natalia's investigation proceeds, she learns Teresa worked for the Camorra, a local criminal organization that is responsible, among other activities, for collecting the money left by people at the many shrines located in and around the city. Though this link provides her with any number of suspects, Natalia believes that the killer must have been someone close to Teresa … and someone with something to hide. These Dark Things is a spare book, spanning just over 200 pages, and a fine start to this series. Despite its relatively short length, there is a considerable amount of contrast to and depth within the story. Contrast is often provided figuratively, sometimes literally, such as in this passage after Natalia interviews an old woman, who cleans the bones of the dead for reburial, souls that had left this world but not yet reached the next. Outside, a turquoise motor scooter backfired; a young girl with rainbow-colored hair clutched the driver around the waist. Street sweepers in lime-green uniforms propped their orange brooms against a wall to take a break. The colors dazzled after the dreary gray of Signora Falcone's morbid world. Depth comes primarily from the complexity of the plot, which provides Natalia with a small number of credible suspects, each with a motive but no evidence for her to make an arrest. The characters — primary and supporting — are an eclectic group, and in less capable hands might come off as impossibly quirky. Instead, there's an authenticity imbued in each that makes them refreshingly real. Possibly a bit too much emphasis is placed on the Camorra in the book — some of the information comes across more as raw academic data than background material for the plot — but this is a minor quibble. How the book ends may seem rather surprising at first, but given all that preceded it, not really unexpected and completely "in character", as it were … and will have readers eagerly looking forward to Natalia's next case. Acknowledgment: Soho Press provided an ARC of These Dark Things for this review.